Having a music themed party? Then you came to the right place! We have dozens of music themed decorations and party supplies to help you decorate for your next big event. Music party decorations can also be combined with other party themes and events from different eras like the Rockin' 1950's or Disco 1970's! Our music supplies come in a variety of sizes from just a few inches to over three feet tall. Cover a classroom in a variety of our Music Note Silhouettes and Neon Musical Note Silhouettes or use them as a teaching aide. You can browse through the entire selection of music supplies seen above or use the search box at the top of the page to find the specific music items you are looking for. It doesn't matter if you are getting ready for a musical production or hosting a Big Band, these musical note decorations can be used to decorate for a great looking party. Music supplies can be used to teach children or use them as theme decorations for a variety of parties. Decorate your locker or wall with removable music note decals or even tie in music supplies to a circus party theme. Our bestselling music party decorations are the black Music Note Silhouettes and the Black Plastic Musical Notes. Each of these music decorations can be used for almost any sort of musically related party or theme event. Teaching students how to read music? These quarter and eighth notes can be used as teaching aides! Music decorations can also be combined with other party themes, like the Hollywood party theme. Music decorations are perfect by themselves, but they can also be combined with so many different party themes as complimentary decorations. The 1920's party theme was all about partying at the speakeasy with some good jazz music. And speaking of jazz music, these music party theme decorations go perfectly with all of the Mardi Gras party supplies for your own Fat Tuesday celebration! Music supplies can be combined with Oktoberfest parties because of the traditional oom pah pah band. 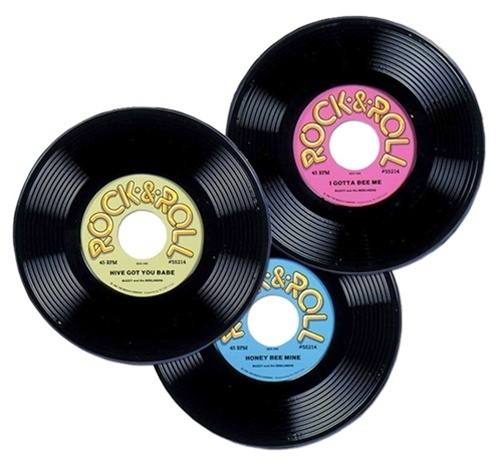 Rock and Roll parties of the fifties wouldn't be as memorable without music and all of those records! There are at least 97 million officially released songs - and growing! In 2017, Nielsen counted 618 billion on-demand music streams (incl. video and audio streams) in the United States. That equates to more than 400 million albums sold, assuming that 1,500 streams are equivalent to buying one album. Idiophones - percussion instruments whose vibrating material is an elastic substance like metal or wood. Electrophones - instruments which synthesize their sounds electronically.